Tube maintenance company Metronet is facing the threat of administration unless there is a last-minute rescue. Metronet is part of a public-private partnership (PPP), which uses private sector money to fund public projects. It had asked London Underground for £551m to cover extra costs to upgrade parts of the Tube system but instead was awarded £121m by the PPP regulator. Metronet said its board would be meeting and no further statement would be issued before Tuesday. 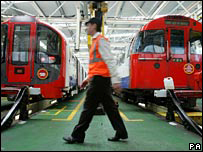 Metronet is responsible for maintaining London's Bakerloo, Central, Victoria, District, Circle and Metropolitan tube lines. The company had planned to invest £17bn over the next 30 years under a PPP scheme. However, it is estimated that there will be an overspend of as much as £2bn by 2010. Metronet has been embroiled in a battle over who should foot the bill. Transport for London (TFL), the transport authority that controls London Underground, said that the overspend was down to mismanagement and a failure to control costs by Metronet. Metronet has countered that TFL and London Underground have changed the specifications outlined in the contracts, asking for higher quality work and more expensive upgrades. Chris Bolt, the PPP arbiter and the man who ruled on the amount of money that was awarded to Metronet, said that the company's costs could have been lower if it had "delivered in an efficient and economic way". "Metronet has been a disaster for its owners, WS Atkins, EDF, Balfour Beatty, Thames Water and Bombardier," the BBC's business editor Robert Peston said. Montreal's Bombardier said later on Monday that it would write off its investment in Metronet. The move will result in a second-quarter charge of about $164m (£80m), the maker of regional aircraft, business jets and rail-transportation equipment said. Should Metronet go into administration, London Underground insists there will be very little impact on consumers and travellers. Metronet is not responsible for the day-to-day running of the underground train system, and London Underground said it would look to ensure that services and maintenance carried on as normal. At the same time, Metronet would continue to function as a company, albeit one run by administrators that would be appointed at a later date. However, one significant change would be that TFL rather than Metronet would probably be left to pick up the bill for any overspending on maintenance or renovation work, analysts said. Unions have also voiced concerns that jobs may be lost if the firm does go into administration. RMT chief Bob Crow has written to both the government and London mayor seeking assurances that thousands of workers' jobs will be secure and maintenance of the tube would not be compromised. The collapse of Metronet would also be a blow to the UK's new Prime Minister Gordon Brown as he pushed through the PPP for maintaining the Tube whilst Chancellor, the BBC's business editor said. Analysts added that the fate of the Tube's maintenance contracts, and whether they should be run by private or public companies, could become a hot political topic as Londoners are asked to vote for a new Mayor.